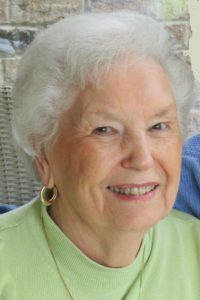 Margaret Powell Benton, born June 1, 1929, died peacefully March 8, 2018 in New Hanover Regional Medical Center surrounded by her family after a brief illness. She is survived by her son Robert Thomas “Tommy” Benton and wife Ellen of Swansboro, daughter June Benton Gray of Wilmington, grandchildren Thomas Benton and wife Anne, Katy Benton Wyborny and husband JD, Ryan Gray and 3 great grandchildren Lainey, Jack and Knox. Margaret was predeceased by her husband of 51 years, Edwin Thomas “Tom”, her parents Robert and Lula Powell, and brothers Leon Powell, Sr. and Glenn Powell. After graduating Flora MacDonald College, she became the Home Economics Agent in Sampson County where she met Tom and after a brief courtship, they married. Tom’s time in the Air Force had them moving to El Paso, TX where Tommy was born, and then to Caribou, ME. After Tom’s discharge, they came back to Smithfield, settled and raised their family. Margaret’s greatest accomplishment and joy was her family. With grace and patience, she created a loving foundation for her family to succeed. To outsiders, it may have appeared that Tom was the decision maker of the family, but their marriage was a true partnership. Her family relied on her strength and resilience as they faced the challenges of life. As her family grew with grandchildren and great grandchildren, she shared her strength and quiet guidance when asked. Margaret was the same with her friendships. She enjoyed playing Scrabble with her daughter and was deemed “Scrabble Queen”. She enjoyed the challenge of board games with family and friends and winning usually went her way. Other hobbies included reading, sewing, gardening and crocheting. A celebration of Margaret’s life will be Monday, March 12 at 11:00 at Pisgah Baptist Church, 3689 NC 210, Smithfield, NC. Visitation with the family will follow at the Powell Family Life Center at the church. In lieu of flowers, please consider a donation to Pisgah Baptist Church or Lower Cape Fear Hospice, 1414 Physicians Drive, Wilmington, NC 28401.